How's that for a title? Settle down, it's not what you think. How Nell Scored is in fact an old-fashioned adventure story, set in New Zealand, involving a shipwreck, stolen pearls, and a cross-country trek by the eponymous young heroine (who is forced to hide up a tree at one point, though probably less gracefully than depicted on the cover). I think this book was first published in 1933, and it certainly shows its age -- the two sons of the family are both away at school, being educated, while the two daughters stay at home to help on the farm. Not fair, or even particularly logical, since the boys will presumably inherit the farm eventually. The book opens with Nell exhorting her sister not to cry in front of their parents, and shaking her vigorously to drive her point home. 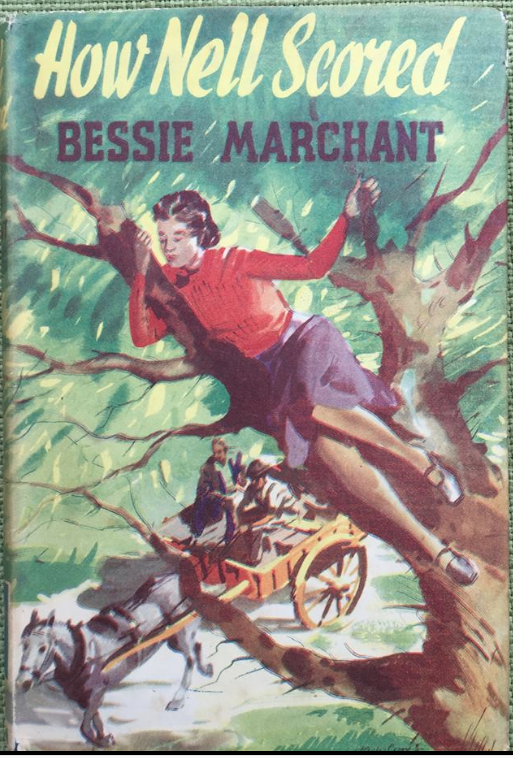 Bessie Marchant was an insanely prolific English author who produced dozens of books like this, often set in exotic locations: Ceylon, Sudan, Uruguay, Canada. She married a clergyman with the gorgeous name of Jabez Ambrose Comfort -- maybe it was the name that appealed, because he was 28 years older than her. 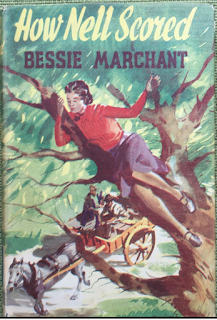 It's easy to mock Marchant's output and her far-flung settings (she doesn't seem to have ever visited any of the places she wrote about) but she did challenge the gender sterotypes of her time by putting young girls in the middle of the kinds of adventures that usually featured boys. So good on you, Bessie. I used to have a little collection of children's books with dodgy titles of the "Sally Pulls It Off" variety, but must have got rid of them in one of my purges. Innocent times! I also had a handful of Jane Shaw's "Susan" books - I couldn't resist "Susan Rushes In" and "Susan Interferes"!